If, like me, you have a book out there for free, you may have noticed that it suddenly stops 'selling' when it reverts to its original price. Devastating, isn't it? This happened to me recently and I think I know why nobody buys it when Amazon suddenly lists it at the original price. First, a bit of background. I have a short story called END OF THE ROAD, which I'd originally priced at 99c. It is part one of five, part two is due out soon. It sold a few copies a week, and it wasn't going to make me rich, so I decided to reduce the price to zero on Smashwords and eventually Amazon price-matched it. 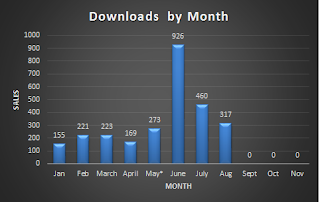 Downloads took off, hitting 155 in the first month. 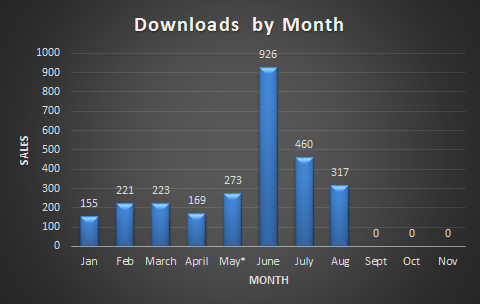 Since then, a steady month on month increase has been recorded (see graph). June was a blip, having been featured on a highly-followed website, but that helped with July's figures, pushing into high visibility on Amazon via its lists and other behind the scenes fumblings. August is showing strong sales and is already on target to surpass July, even though we are only halfway through the month. It's clear that the numbers are increasing month on month, despite the book suddenly being listed on Amazon.co.uk at its original price for a few days in August. This caused the UK downloads to stop dead, effecting my overall figures. The first thing I did was go to the book page on Amazon and click on the link "Tell us about a lower price", to notify them that the book is STILL free elsewhere (Smashwords is not sufficient, you must give a link to your book being sold on an online store such as Apple or Sony). Eventually, it will revert to free again. Whilst I was waiting for the price to match I was astounded that whilst it remained at the .99p price, none of my UK compatriots considered buying the book, despite it being very little outlay for months of hard work by this author. It was only when I looked at the list the book was in that I realised. As a free book, it routinely hit the #1 spot in its category, and even now rarely leaves the top-ten free books for several categories. When the book reverted to a priced book, it vanished from these lists, being shown as number 514,346th or there abouts. Clearly, at that rank, nobody but the saddest of late-night book browsers are going to find it so it WILL NOT SELL! The simple reason it gets downloaded when it is free is that it is visible on the top ten list of its category and people can see it and download it, but when priced it vanishes from view ( or to 1/2 million books back). It is not because nobody is willing to spend a meagre amount on your years of work, it is because they can't find it. So the moral of this post is, keep your first book for free (look at how many people are downloading a book with my name on it - almost 1 per hour EVERY day, 24hrs per day) and keep on writing that second book because, even if you sell it for a price, those people that downloaded your free book are going to get to see your next one, because your first book will link to it, and because Amazon will make sure they do.